The muddiest part of this trip might have been the first 10 minutes scrambling through the Moo paddock in the dark, as we made our way to the Tararuas entrance from Poads Road. Given that it was lined with an un-advertised electric fence, Enrique even managed to get shocked several times as he tripped and grabbed the fence, before he realised what was happening. Location: Tararua Forest Park, Ohau Region. People: Alistair, Dirk, Enrique, and me. Huts visited: Te Matawai Hut (1 night). Intended route: Poads Road to Ohau River via Ohau Gorge, up Deception Spur to 865 metres, down to Girdlestone Saddle, then along the track to Te Matawai Hut, along Yeates Track to South Ohau river, back to the base of Deception Spur (via river), then out to Poads Road via river and track. This was a medium-rated navigation trip with the Wellington Tramping & Mountaineering Club, and it was my first time back in the Tararuas since returning from overseas. Our original plan had been to camp in a clearing on Friday night, 45 minutes from the road-end, possibly walking another 15 minutes up the river to an unofficial canvas bivy that Alistair knew about. After some consideration of the cold conditions, though, we instead decided to set up our tent flies over the track, and under the trees, w30here it was still relatively warm. Walking along the Ohau River. We woke about 6.30 when it was getting light (hooray for summer), and after an hour or so of breakfast and packing up, we were on our way to the Ohau River. 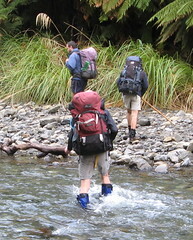 Nobody had any reservations about washing our muddy boots in Levin’s primary water supply, and we walked up the river to our first main venture off-track — up Deception Spur. The track up the spur is quite overgrown near the base, but it thins out after about 15 minutes or so, and becomes easier to walk up. We had maps and compasses out a lot during this trip, and at the base of the spur was probably about the first time it started mattering. After climbing to the 865 metre mark, we began the slightly more complicated task of figuring out how to get down the other side. Alistair had been here many times before, and let the rest of us try to work out where to go. We nearly went down the wrong spur in the beginning, until Alistair noticed that there was a ridge much too close through the trees on the left. That ridge, of course, happened to be exactly where we were supposed to be. It could have been much worse than it was, and we really only needed to sidle and climb about another hundred metres or so back up the hill. We then made our way down to Girdlestone Saddle. DOC had gone to great efforts with the standard orange triangles to make sure people went the right way from this saddle, and once we actually crossed the main track, it was easy to pick it up and follow it the rest of the way to Te Matawai Hut, roughly 1.5 hours away. After an 8.5 hour day of walking, we reached Te Matawai Hut at 4pm, which gave us an opportunity to sit around and relax for an hour or so. Te Matawai Hut is rather large. It has a bunk-room with space for about 16 matresses, but there’s probably space for about 50 people in total if there was really a need. A small group of 3 from the Vic Tramping Club had passed through earlier in the day on their way to Arete Biv, but as it turned out, we had the entire hut to ourselves. The bunk room was freezing, and stayed that way. 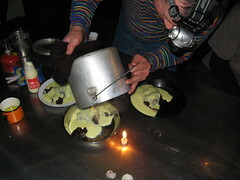 Later on, at Dirk’s suggestion, we successfully used it as a refrigerator to set the jelly mixture that we had for dessert. We also took advantage of the empty hut, and dragged some of the mattresses into the main room, which eventually was almost too warm from the fire that Dirk and Enrique had managed to get going when we arrived. Alistair was primarily responsible for arranging the menu on Saturday night. He’s slowly working his way through recipies in Jon Sawyer and Liz Baker’s book titled Gourmet Tramping in New Zealand , and the dinner on Saturday night (some kind of pork stir-fry, mashed potato, brussel sprouts, and a chocolate-raspberry jelly topped with custard) was fantastic. It was well worth carrying a little extra weight, and I don’t think anyone in our group could complain about being under-fed. Sunday was a little more relaxed. We made our way along Yeates Track down quite a steep spur, to the former site of the South Ohau Hut, which no longer exists. From here it was basically a walk along the river. This was a little difficult for a while, and there were some places where I was a bit concerned about slipping off some of the more awkward rocks, but we all managed to get through. As we reached the base of Deception Spur at about 10.45am, we co-incidentally ran into the other club trip, which was returning along the North Ohau River, from North Ohau Hut. The remainder of the trip was quite leisurely. We stopped for a lunch with the other group, and a couple of hours later we were back at the road-end. Overall it was a good trip. 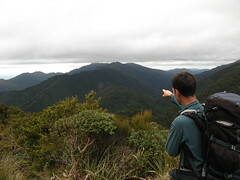 1 Comment To "Trip: Te Matawai Hut via Deception Spur"